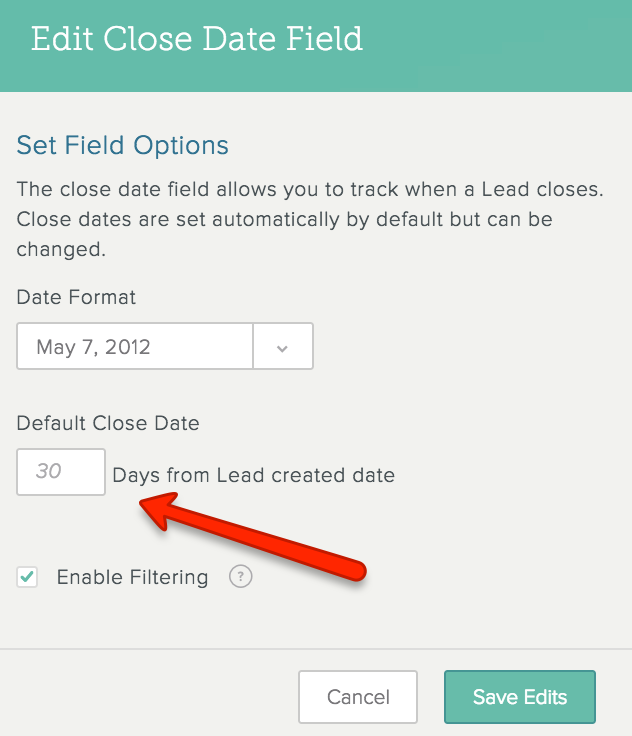 When you create a List, it automatically includes the Status, Owner, Created Date, Close Date, and Revenue fields, because these fields are key to any process you track in SalesforceIQ. Learn more about other field types here. 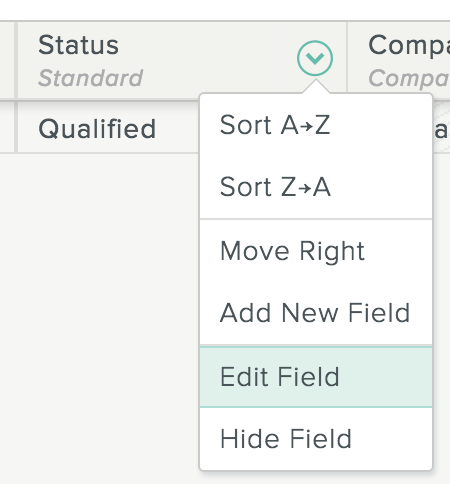 Note: Except for Revenue, you can't delete a default field. You can only hide it from view. Statuses in SalesforceIQ represent the different stages of your process or pipeline. You can completely customize statuses to match your specific workflow. For example, in a sales process, opportunities start out as Leads and then move through statuses such as Contacted, Qualified, Demoed, Pilot, and Deal Won or Deal Lost. Your active statuses should reflect your current pipeline and represent key stages of your process. Your team should update a deal's status regularly to receive the most accurate reports. Note: As a best practice, you should always list your active statuses in the order a deal moves through your funnel, with your last active status as the final stage in your process—for example, Closed, Deal Won, etc. Check out our workflow-specific Best Practices guides to learn more about statuses we see most commonly. Reporting—Changing the status of a List object (lead, opportunity, etc.) moves it along through your pipeline. This movement is reflected in your report. 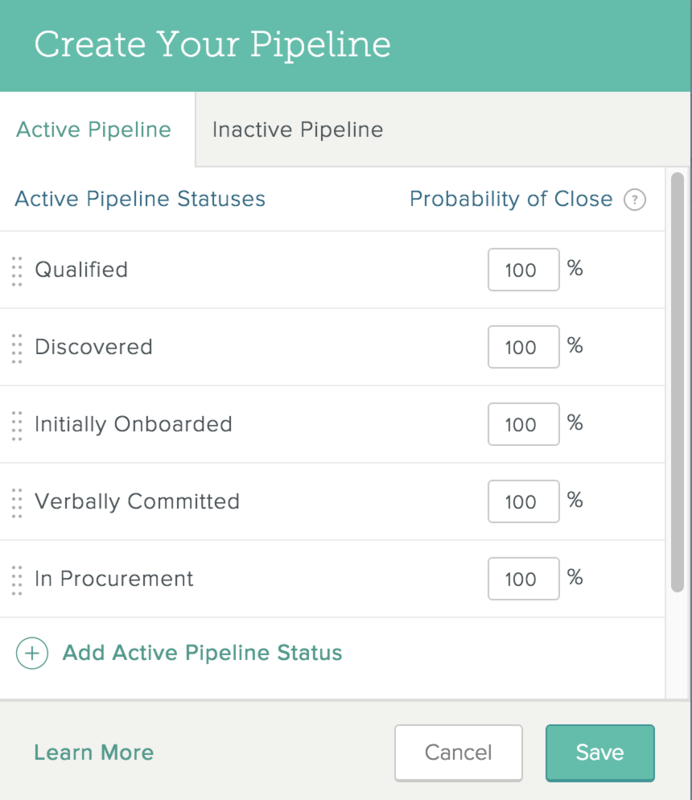 All Sales and Pipeline reports are based on your last active status—for example, Deal Won or Closed. In addition, you can set the probability of closing for each active status and include this forecast in your sales reports. Inactive statuses are removed from your active pipeline. Saved filters—By default, every user sees an All Active saved filter in the Grid. This shows all statuses designated as Active. In the List Grid view, click the downward-facing arrow to the right of the Status field header, and then click Edit Field. On the screen that appears, click Active Pipeline or Inactive Pipeline, depending on the type of status you want to add. Click Add Active/Inactive Pipeline Status in the lower-left corner. Enter the status name and press Enter/Return. You can edit statuses in any of the following ways. After you make any status edits, click Save to save your changes. To change the display order of either your active or inactive statuses—Click and hold to the left of the status name, and then drag and drop the entry to a different position in the list. This determines the order in which the entries appear when you click in the Status field. You should always order active statuses in the order that a deal takes as it moves through your funnel. To change the probability of close—Click the percentage field to the right of the status name and enter a new value. To rename a status—Hover over the status name and click to the right. Enter a new name and press Enter/Return. To delete a status—Hover over the status name and click to the right. Enter or select the status to which List objects in this status should belong, and then click Delete. To change a status from active to inactive, or vice versa—Hover over the status name and click to the right. The Owner field defaults to the person who creates a List object. You can change the owner to any List user. To change a List object owner, double-click the field and select the new owner from the list of users that appears. You can use the Created Date field to show when a List object entered your pipeline. When you create a List, the Created Date field is included by default. For each object you add to the List, the Created Date field shows the date the object was created automatically. You can edit the date shown in this field to accurately represent the date the List object was created. 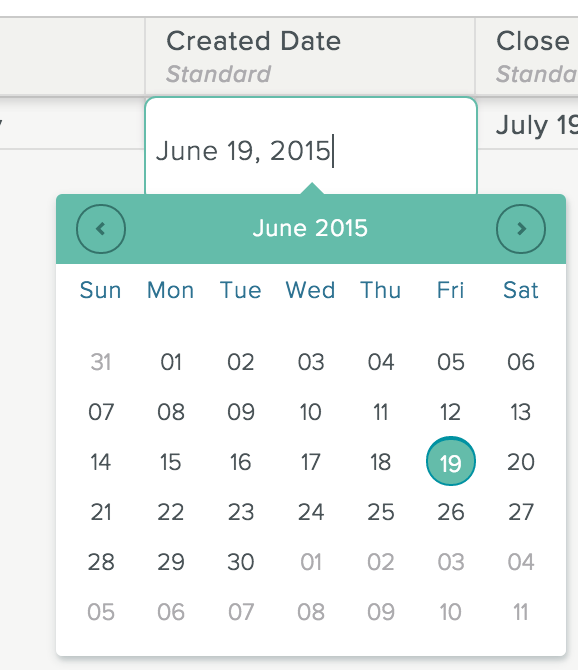 To edit the Created Date field, double-click the field and enter a new date or select it from the calendar. Note: This field replaces the Created Intelligence Field. Use the Close Date field to track the expected close date of active deals. The Close Date field shows the date a List object reaches the final active status automatically. The Close Date field defaults to 30 days after the created date. Organization admins only can edit this field to change the default close date. In the Grid view, any user can edit the date shown in the Close Date field to accurately represent the date you closed or won the deal represented by the List object. 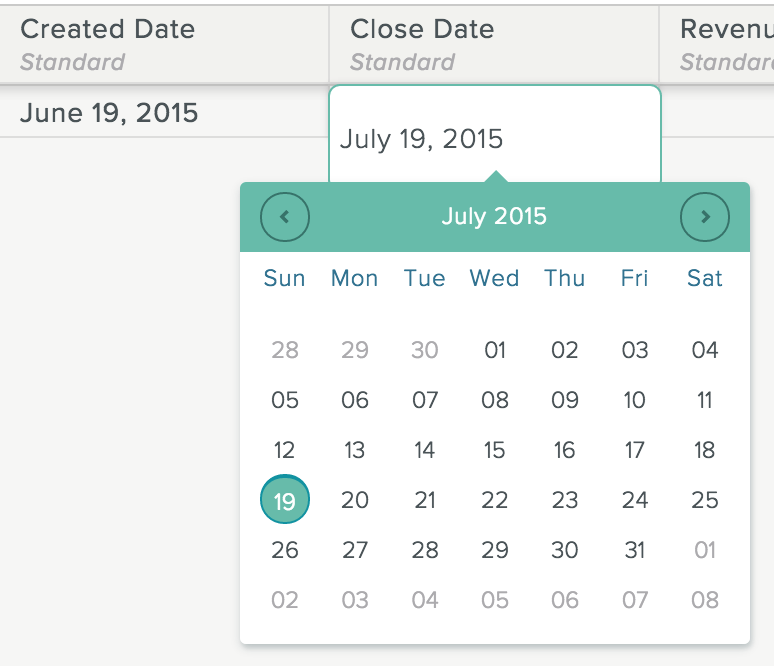 To edit the Close Date field, double-click the field and enter a new date or select it from the calendar. You can also use this field can to track the projected close date for active opportunities. Keep your projected close dates up-to-date to view your current forecasted revenue in your sales reports. The Revenue field is a standard number field that lets you track revenue for each List object. The Revenue field is included when you generate reports and forecast the probability of closing deals.